With the NBA taking an all-star break in the season, it gives us a chance to check on the ten Bruin alumni currently playing in the league. Arron Afflalo, Detroit Pistons: In just half a season NBA crowds are learning what UCLA basketball fans have known for quite some time - there is no denying the heart of a warrior. Afflalo has played a major part in the Detroit Piston's surge to a 39-13 record and first place in the Central Division. Coming off the bench, Afflalo brings a unique brand of defensive intensity onto the floor. Whether it is guarding 6'6 Kobe Bryant on the perimeter or 6'10 forward Rashard Lewis down low, Afflalo makes it hard for players to get the ball and even more difficult for them to get off a clean shot. He is averaging 3.5 points in 11.5 minutes a game and is usually given the assignment of guarding the opponent's best wing player (Sound familiar?). Afflalo is shooting 42% from the field but only 21% on three-pointers. If he is going to continue to be a factor in the league, he'll need to improve on his outside shooting. In the meantime, a once aging Piston team now possesses a promising young backcourt nucleus of Afflalo and fellow first-rounder Rodney Stuckey for years to come. Trevor Ariza, Los Angeles Lakers: In what appeared to be a promising new beginning in Los Angeles, took a bad turn back to some old problems. Ariza, who was finding his niche with the upstart Lakers, fractured his right foot at practice in late January. He has had been plagued by foot injuries and other lingering health problems throughout his young NBA career. Ariza is averaging 6.5 points and 3.5 rebounds in 24 minutes since being acquired from Orlando in November for Brian Cook and Maurice Evans. He is expected to return to the Lakers prior to the playoffs in March. Matt Barnes, Golden State Warriors: Barnes has established himself as a tough all-around performer in the league. He is averaging 8.1 points, 5.0 rebounds, and 2.7 assists in 45 games this season. Barnes' minutes have gone down somewhat since the signing of free-agent Chris Webber, but he remains an invaluable member on the Warriors ball club. His high-energy style of play is a perfect fit in Coach Don Nelson's system. Baron Davis, Golden State Warriors: Although he was not named to the All-star team this season, many believed Davis was deserving of a slot. He is averaging 21.6 points, 8.0 assists and 4.8 rebounds in almost 40 minutes of action per game. He has been the team's leader both on and off the court in helping the Warriors to an impressive 32-20 record this season. Jordan Farmar, Los Angeles Lakers: The Lakers view Farmar as their point-guard of the future after trading 2007 first-round draft pick Javaris Crittenton to Memphis in the Pau Gasol deal. Its an ideal situation for Farmar in Los Angeles who is playing major minutes while being mentored by veteran Derek Fisher. 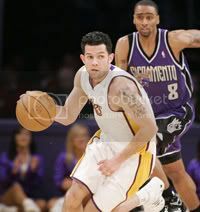 Although he has struggled in the past few games, Farmar is still averaging 9.2 points and 2.7 assists in 20.8 minutes. He was picked to play in the freshman vs. sophomore game during All-star weekend. Dan Gadzuric, Milwaukee Bucks: Perhaps one of the more athletic big men in the league, Gadzuric brings a lot of energy off the bench for the Bucks. He is averaging 3.1 points and 2.5 rebounds in 9.9 minutes. Ryan Hollins, Charlotte Bobcats: The opportunties have been there for the young center, but Hollins has been unable to capitalize on them. The season started with much promise for Hollins since the Bobcats were short along the front line due to injuries. But Hollins has been inconsistent at best, and is now playing behind journeyman Nazr Mohammed. Hollins is averaging 2.4 points and 2.2 rebounds over 39 games. Jason Kapono, Toronto Raptors: Signed to a big contract over the summer by the Raptors, Kapono has been relegated to a contributor off the bench with ex-NBDL player Jamrio Moon taking his spot in the starting line-up. Kapono's biggest weakness has been his defense and ability to guard high-scoring wings. He is averaging 8.2 points while shooting 50% from the field and 51% on three-pointers. He will be at the All-star game to defend his three-point shooting crown. Darrick Martin, Toronto Raptors: With T.J. Ford injured much of this season, the 36 year-old Martin has played more minutes than expected. Although he is still closer to being a coach than a regular contributor on the court, Martin is managing to average 1.8 points and 1.3 assists in 8.9 minutes of action per game. Earl Watson, Seattle Sonics: Watson has been on the verge of being traded all season, however, he just continues to produce. The 6'1 guard from Kansas City is averaging 8.6 points and 6.5 assists this season. Last week he earned a triple-double by recording 23 points, 10 rebounds, and 10 assists in a win over Sacramento.